Charles Hugh Smith is an avid asker of questions, and he does not mince words when his inquiries lead him to difficult answers. Often, they highlight the strange and conveniently ignored truth that modern money has no value in and of itself. When confronted with an asset that defies dilution, that can’t be increased in quantity (such as gold), market participants who are not in a position to manipulate those markets have no choice but to obtain more money if they want to buy more of that fixed-quantity asset. If that asset is consumed/destroyed over time (such as oil), there will come a time when no amount of money will buy more. When inflation, deflation, and all the rest cease to have meaning. If no oil exists, a dime or a million dollars will buy the exact same amount. 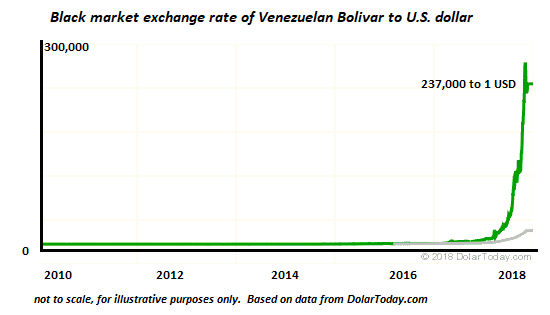 Venezuela's "money" exemplifies the future of all "money,", including the euro, yen, yuan/RMB and the U.S. dollar. There is nothing inherently permanent or valuable in "money" printed by central banks or governments; they are nothing but fast-accumulating claims on a diminishing supply of future energy. To understand the synchronized global meltdown that is on tap for the 2021-2025 period, we must first stipulate the relationship of "money" to energy: "money" is nothing more than a claim on future energy. If there's no energy available to fuel the global economy, "money" will have little value. The conventional economists assure us that energy is now a small part of the overall economy, so fluctuations in energy prices will have a limited effect on global prosperity. But what's left of global prosperity when energy is unable to meet current demand at any price that consumers can afford? We're going to get a synchronized global dynamic, but it won't be "growth" and stability, it will be DeGrowth and instability. The harsh realities of energy, "money" and mis-governance will come home to roost, and all the fantasies that technology and central banks printing "money" will save us will dissolve into thin air.